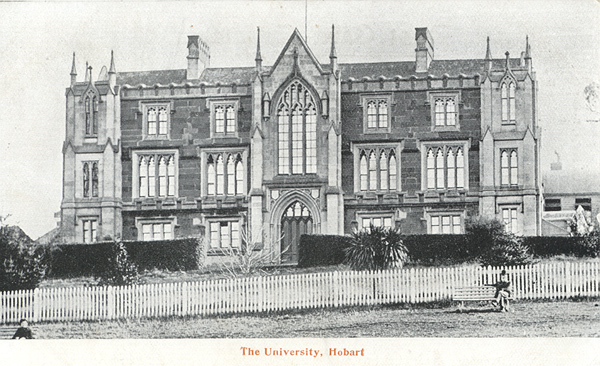 The University of Tasmania was established in 1890, after the abolition of overseas scholarships provided funds. Three lecturers began teaching a handful of students in 1893. Parliamentarians branding it an unnecessary luxury made the University's early existence precarious. The institution's encouragement of female students fuelled criticism. James Backhouse Walker, a local lawyer and briefly Vice-Chancellor, mounted a courageous defence. By the First World War there were over one hundred students and several Tasmanian graduates were influential in law and politics. According to Chancellor Sir John Morris, from 1918 until 1939 the institution still 'limped along'. Distinguished staff had already appeared, such as historian William Jethro Brown, physicists and mathematicians Alexander McAulay and his son Alexander Leicester McAulay, classicist RL Dunbabin, and philosopher and polymath Edmund Morris Miller. Housed in the former Hobart High School, facilities were totally outgrown, but the state government was slow to fund a new campus on the old Sandy Bay rifle range. During the Second World War, while the Optical Munitions Annexe assisted the war effort, local graduates, replacing soldier academics, taught a handful of students. New post-war staff, many with overseas experience, pressed for removal to adequate facilities at Sandy Bay. Chancellor Sir John Morris, also Chief Justice, though a dynamic reformer, antagonised academics by his authoritarianism. Vice-Chancellor Torliev Hytten, an eminent economist, saw contention peak while the move to Sandy Bay was delayed. In a passionate open letter to the premier, Philosophy Professor Sydney Orr goaded the government into establishing the 1955 Royal Commission into the University. The Commission report demanded extensive reform of both University and governing council. Staff were delighted, while lay administrators fumed. In early 1956 Orr was summarily dismissed, mainly for his alleged though denied seduction of a student. A ten-year battle involved academics in Australia and overseas. Orr lost an unfair dismissal action in the Tasmanian Supreme Court and the High Court of Australia. The Tasmanian chair of Philosophy was boycotted. In 1966 Orr received some financial compensation from the University, which also established a cast-iron tenure system. The latter disappeared with the federal reorganisation of higher education in the late 1980s. In the early 1960s the University at last transferred to a bright new campus at Sandy Bay. It profited from increasing federal finance following the 1957 Murray Report. Medical and Agricultural Schools were established and the sciences obtained adequate laboratories. Physics achieved world recognition in radio astronomy, while other departments attracted good scholars and graduates were celebrated in many fields. Student facilities improved remarkably. In 1981 the University incorporated the College of Advanced Education, recently established on nearby Mount Nelson, which raised numbers to 5000. At the end of the decade the 'Dawkins Revolution' and the unified national system ensured amalgamation with the Tasmanian State Institute of Technology at Launceston. Though the University retained its old name, like other contemporary institutions, it entered, with over 10,000 students, a new era dominated by market forces rather than generous public funding. Further reading: R Davis, Open to talent, Hobart, 1990; and 100 years, Hobart, 1993.